The parents of a minor child, who was born with severe birth defects allegedly caused by the child’s mother taking a prescribed anti-seizure medication during her pregnancy, did not convince a federal jury in Ohio that the manufacturer of the drug, Depakote®, failed to provide adequate warnings of the drug’s risks. The jury also determined that the manufacturer was not liable on the parents fraud claim (Z.H. v. Abbott Laboratories, Inc., February 2, 2017, Boyko, C.). The child was born in 2003 with a number of severe birth defects allegedly caused by the mother’s use of Depakote, an anti-seizure medication formulated, tested, manufactured, and marketed by Abbott Laboratories, Inc., and Abbvie, Inc. (collectively, Abbott), during her pregnancy. Approved and sold in the United States since 1978 for the treatment of certain forms of epilepsy, the drug is promoted as an effective anti-epileptic drug (AED). The child’s parents, however, alleged that the drug is defective and dangerous for its intended use because its primary compound, valproic acid, is teratogenic—i.e., of, relating to, or causing developmental malformations/birth defects if taken during the first trimester of pregnancy. The parents further alleged that Depakote is riskier than other AEDs for women who are/may become pregnant and that Abbott was aware of the heightened risks of birth defects from the drug, yet continued to market and distribute it in the U.S. without adequate warnings. The parents claimed that Abbott failed to communicate the heightened risk of birth defects to doctors and women and, instead, minimized the risks and downplayed the dangers in their product labeling. State law claims and proceedings. In their complaint, the parents asserted Ohio state-law claims against the drug maker, including strict products liability for inadequate warning and design defect, nonconformance with representations, negligence, and fraud. The court, in a September 30, 2016 ruling, granted summary judgment to the manufacturer on the parents’ claims for strict liability design defect, negligent design, breach of express and implied warranties, negligent misrepresentation, and punitive damages under the Ohio Product Liability Act (OPLA). 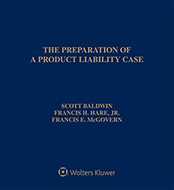 The parents were permitted to proceed only on claims for strict liability due to inadequate warning and fraud (as well as an accompanying punitive damages claim as to the issue of fraud) [see Products Liability Law Daily’s October 4, 2016 analysis]. Jury decision. The jury did not find, by a preponderance of the evidence, in favor of the parents on their claim that the manufacturer failed to provide adequate warnings of the risks of Depakote. Nor did the parents prove their claim that the drug was defective due to its failure to conform to the manufacturer's representations. The jury also ruled against the parents on their fraud and loss of consortium claims. The case is No. 1:14CV176. Attorneys: Blair R. Loocke (Bracewell LLP) for Kevin Hutchens. John A. McCauley (Venable LLP) and S. Peter Voudouris (Tucker Ellis LLP) for Abbott Laboratories, Inc. and AbbVie Inc.